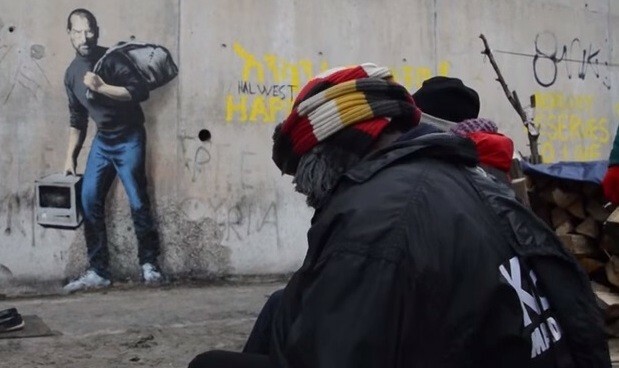 In a classic case of art imitating life, English street artist Banksy recently created and installed a Steve Jobs graffiti art at the refugee camp in Calais, France, creating a stir in social media. The mural shows Jobs carrying an early computer while a sack is slung over his shoulder. The artist's message has successfully diverted attention to the plight of refugees in the fire-prone and unsanitary place that has become the temporary second home of around 6,000 refugees. Banksy embarked on a series of artistic works as a response to the refugee crisis. The artist, who counts famous Hollywood celebrities like Brad Pitt and Angelina Jolie among his clients, is the creative brain behind Dismaland, an exhibition of macabre art that unfolded in the United Kingdom from August to September. Banksy used the leftover infrastructure from that exhibition to construct emergency shelter for thousands of migrants, The Guardian reported. The migrants came not just from Syria but from Afghanistan and Eritrea, a country situated in the Horn of Africa. Banksy's mural conveyed that while certain quarters have the notion that migrants may drain the host-country's resources, they may not be seeing the potential of some of these people. The biological father of the late Apple co-founder, Abdulfattah Jandali, hailed from Homs, Syria. Several people saw Banksy's images featured on his website as well as in numerous sites and the message went viral. Writer John Nichols was among those who tweeted that people proposing to ban refugees from entering their country ought to consider that Jobs was a Syrian immigrant's son. Another writer noted, however, that the message that Banksy's art conveyed may be missing an important point pertaining to the refugee crisis. While it was effective in highlighting the Calais refugee situation that may prompt more people to come forward with help, it tended to gloss over one crucial point. Of the millions of people feeling war or persecution in their homeland, the multitude may be just ordinary humans not destined for greatness. Nonetheless, they still deserve help or some form of relief from their suffering, Wired reported. Many other individuals and organizations have shown empathy for Syrian refugees who have gone through the most traumatizing experiences after fleeing their homeland. In other news, the non-profit organization called Hummingbird Project deployed nurses, doctors, builders and volunteers. Hummingbird Project shared snippets of the realities and help pouring in for refugees. It also wrote on its Facebook page that it is grateful for all the support given. Which Do You Prefer? Dismaland, UK’s Macabre Attractions Or Thrilling Joy Rides at Hello Kitty Chinese Theme Park?